Billionaire Mark Cuban gives Altucher an inside look at what it was like to make billions of dollars and the hard work it took to create the journey of a lifetime on The James Altucher show last week. “Luck is a matter of scale, but effort is everything else…” stated billionaire entrepreneur Mark Cuban in a recent interview on The James Altucher show, a weekly podcast produced and distributed by The Stansberry Radio Network. In the candid interview, Cuban shared personal and specific accounts of his career, how he made his fortune, and what lies ahead for the illustrious billionaire. In addition to a personal recount of his first business (a successful bar in college) to the first company he sold, (MicroSolutions), Cuban gave the inside scoop on how his subsequent business ventures began and then soared to epic proportions. Cuban also gave specifics about his recent case with the Securities and Exchange Commission (SEC) and how the experience made him begin to think of privacy solutions for the digital age, ultimately leading to the creation of his latest venture, Cyber Dust a secure instant messaging environment where communication evaporates over a specified time. The interview with Cuban was one of many high-profile guests featured weekly on The James Altucher show, which has recently hosted Arianna Huffington, Tim Ferriss and Freakonomics, Stephen Dubner. “Altucher is getting some of the biggest names out there,” said the show's Executive Producer, David Newman. “This is the Cuban interview you won’t hear anywhere else.” The entire interview can be found here. The James Altucher Show is the latest podcast added to the impressive lineup of shows produced and distributed by the Stansberry Radio Network. 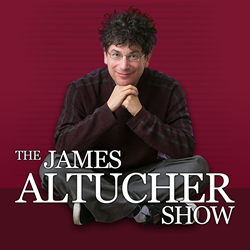 James Altucher encourages listeners to “Choose Themselves” amidst life’s chaos to produce fulfilling lives ‘above the noise’ of the everyday. Listeners can expect The James Altucher Show to features a rich line-up of elite guest who help James spread the Choose Yourself message. Guests of The James Altucher Show include impressive names such as Arianna Huffington, Mark Cuban, and Dr. Wayne Dyer. These all-stars whose expertise and experience combined with James' provides each hour with insight, teaching and entertainment we think you won't find anywhere else.